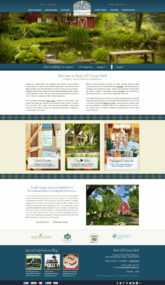 InsideOut Solutions is very proud to announce the launch of the new website for West Hill House B&B in Warren, Vermont. 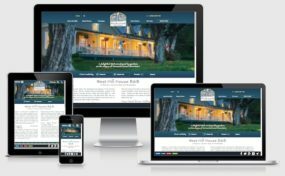 Innkeepers Peter and Susan MacLaren are longtime website design, hosting, internet marketing and print services clients and we are delighted to continue serving their online marketing needs. The new website features custom responsive WordPress web design crafted collaboratively with Peter and Susan. 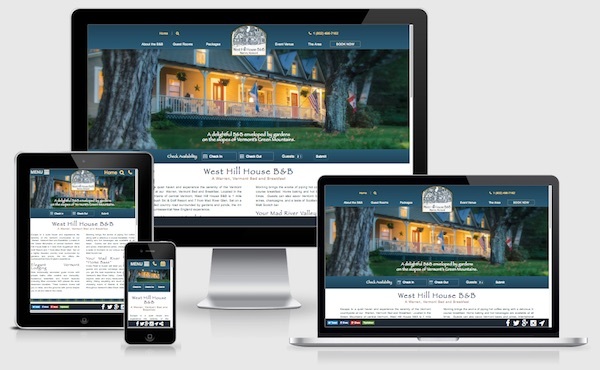 This was our third website design for West Hill House B&B. 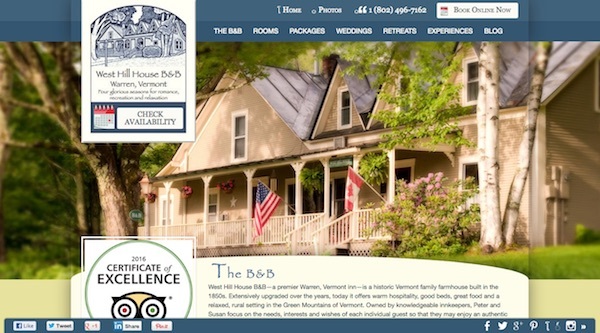 Peter and Susan originally came to InsideOut as a web design and hosting client when they purchased the inn in 2006. We built the first website for Peter & Susan using our proprietary WebTools Content Management System. This basic website evolved over a period of six years, including the addition of a WordPress blog for Peter to stretch and flex his considerable online marketing muscles and increase search engine visibility and traffic. Placing Schema structured data markup for search engines to better index information about the B&B. In 2014 we converted the website to be responsive for all devices, alleviating the need for a separate mobile site and bringing the coding up to current standards. Peter met with InsideOut Solutions president Pat McCauley and internet marketing manager Shawn Kerr at the Association of Independent Hospitality Professionals 2017 Summit in January of this year. We discussed their marketing efforts, the services we were providing, and ended with a rough outline of what we would do through the summer season. Shortly after the meeting, Peter contacted Pat to let her know that he wanted to discuss how we could deepen the marketing relationship we have with West Hill House B&B. To ensure a well-considered proposal, Pat met with the website design, web development and internet marketing leads. After some back and forth conversation with Peter, presented a marketing strategy proposal in March. The centerpiece of that proposal was to design and develop a new website. Peter and Susan knew their five-year-old website needed a redesign to provide a better visitor experience. Rather than simply redoing the custom responsive WordPress theme, we proposed a complete redesign, including a consolidation and simplification of site navigation that had grown over-large and ungainly over the last few years. By the end of March we had a contract and moved into production. As with all of our custom website projects, web design lead Beth Edwards sent a design questionnaire to Peter and Susan to get an initial sense of the user experience the innkeepers wanted to provide their site’s visitors. The responses and subsequent discussions formed a clear design picture for Beth’s work in creating a custom “look and feel” for the website. As this was a complete redesign, there was no design element that was off the table. Colors, patterns, fonts, text styling, images and photos we all carefully considered. The new navigation menu removed the bulk that was so problematic with their previous website. Beth Incorporated the MacLaren tartan into the layout as a new element that was warmly received by the innkeepers. 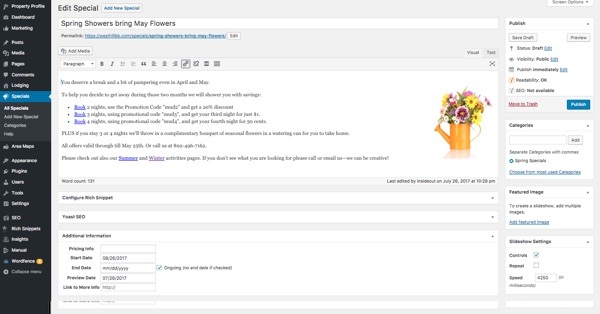 Once the final tweaks were reviewed and approved by the Peter and Susan, Beth passed the project to web development lead Jack Waknitz to build the theme for this custom WordPress web design. Beth then went to work on filling in the sites pages. Content was updated and edited as needed to fit the new page navigation menu. New photos were carefully optimized and inserted into headers and galleries. Text was rewritten as needed to be in line with the new marketing message Peter and Susan had chosen. Setting up over 300 redirects to eliminate “page not found” errors due to the structural changes to the website. Submitting website and updated sitemap XML file to search engines to speed up indexing of all the changes. 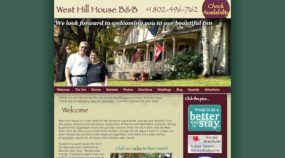 The new West Hill B&B website was launched by Brad Doss, our server administrator on August 17. We thank Peter and Susan for giving us the opportunity to grow our marketing partnership with West Hill House B&B. Considering a Custom Responsive WordPress Web Design? 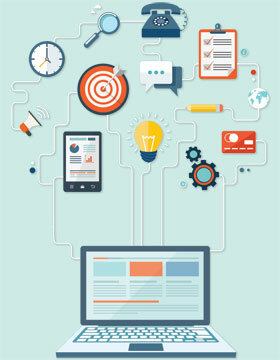 Web development is constantly evolving. A new custom responsive WordPress web design from InsideOut Solutions starts at $7,500 and may be financed at $270 per month (based on $1,000 down + 24 monthly payments). We invite you to view our Custom Design Portfolio and contact us today for a quote to bring your website marketing efforts up to the cutting edge.